In East New York, rent burdening is an issue for about 84 percent of households making less than $35,000, but only four percent of moderate-income households. With the de Blasio administration seeking to rezone neighborhoods across the city to promote the development of both market-rate and affordable housing, many local advocates have expressed concerns about a lack of units for families making the lowest incomes. In some areas, however, there are also stakeholders arguing that their neighborhoods already have too much low-income housing and need families with higher incomes to support economic growth. They assert that it’s the middle class that’s stressed, with families unable to afford market-rate housing or qualify for low-income programs. “If we continue to saturate the Bay Street Corridor with predominately low-income housing, those hard-working individuals in the middle class will have nowhere to go but outside the borough,” wrote Borough President James Oddo to the administration this summer in a bid for the rezoning of the Bay Street corridor to include “workforce housing,” which targets households making 115 percent AMI, or $94,000 a year for a family of three. Census data pulled by the Association for Housing and Neighborhood Development (ANHD) for eight neighborhoods that have received, are slated for or could possibly be in line to get a rezoning shines a light on which families really have the greatest need for affordable housing. 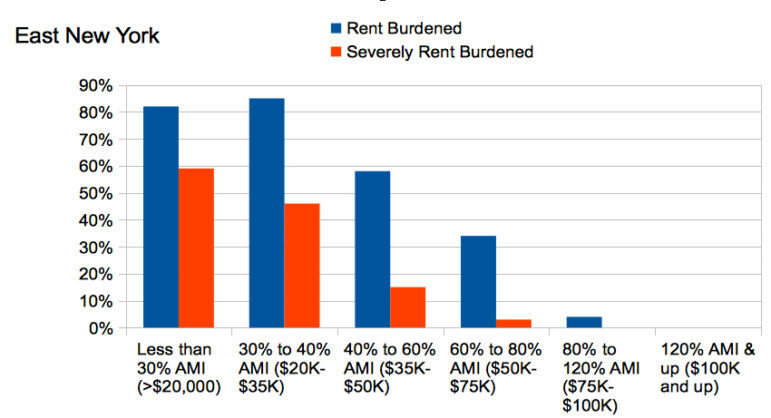 In general, the data shows that households making less than $35,000 suffer far greater rent burdening than moderate-income households making between $75,000 and $100,000 a year. 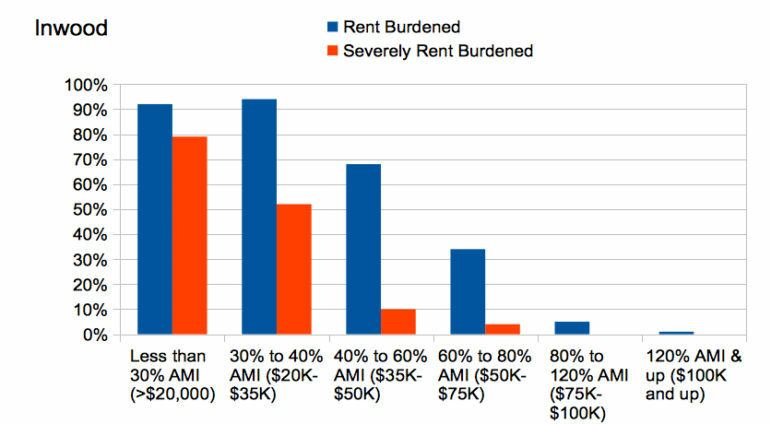 A family is considered rent burdened when they pay more than 30 percent of their income on rent. Or East New York. 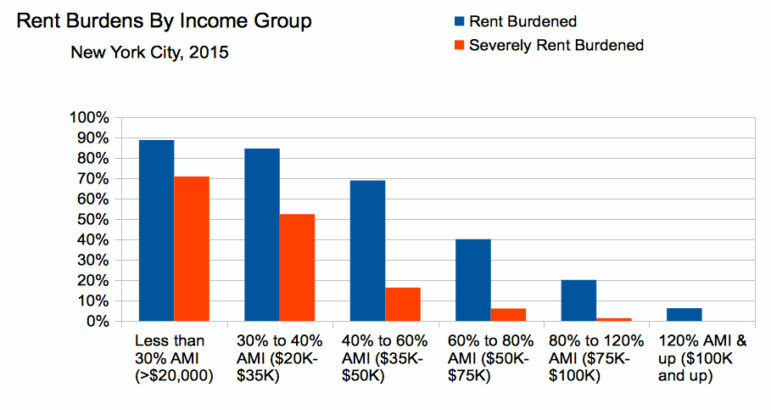 Rent burdening is an issue for about 84 percent of households making less than $35,000, but only four percent of moderate-income households. 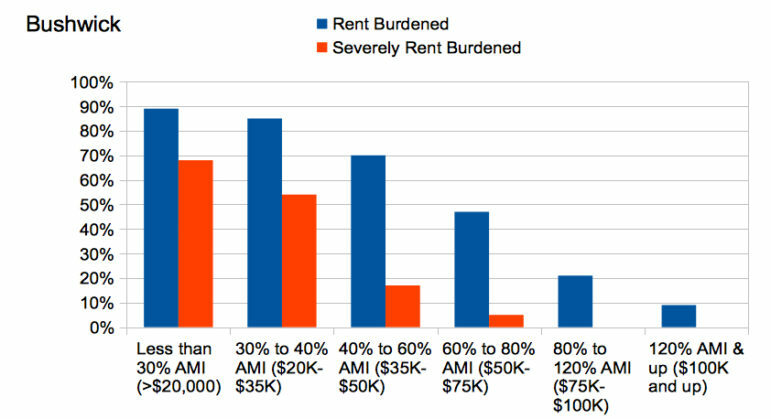 The picture grows starker when one looks at “severe rent burdening,” which describes when rent exceeds 50 percent of a household’s income. Whether in low or high-income neighborhoods, less than five percent of moderate-income households suffer severe rent burdening. Poor families, however, suffer high rates of severe rent burdening, and the lower the income, the higher the rate. For instance, in northern Staten Island, 76 percent of households making less than $20,000 are severely rent-burdened, as compared to only 53 percent of households making between $20,000 and $35,000. 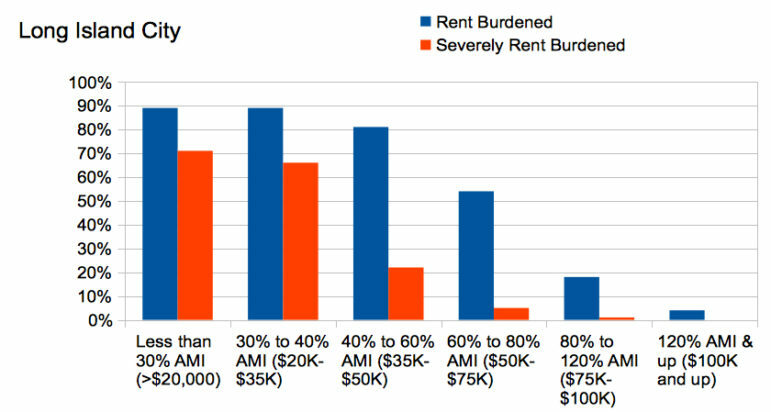 These conclusions about rent burdens are based on self-reported Census data that, depending on how households think about their rent and income, might not account for Section 8 vouchers and certain other public benefits more likely to be held by folks at the lowest end of the economic ladder than those slightly higher up, and possibly more concentrated in some areas than others—although the impact of such benefits on our overall conclusions would be modest. * The data does account for households living in public housing, where families pay only 30 percent of their income on rent, so areas with more public housing are likely to see lower rent burdens. For instance, consider that among the eight rezoning neighborhoods considered, Inwood had the highest levels of severe rent burdening, with 79 percent of households making below $20,000 affected, as opposed to a far lower (though still significant) 46 percent of households in East Harlem. More study is required to understand this difference, but perhaps one factor is the size of the existing public housing stock. Only four percent of Inwood’s housing stock is public housing, as opposed to 28 percent of East Harlem’s housing. These findings have a variety of implications. 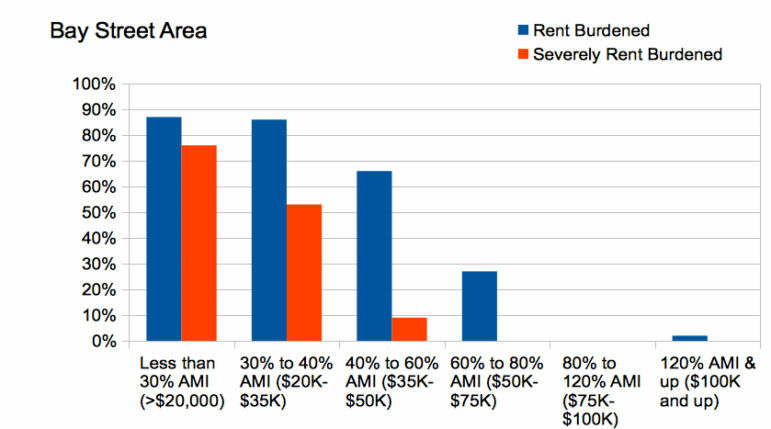 For low-income neighborhoods like Jerome Avenue or Inwood, the data suggests that if one’s goal is to alleviate local rent burdening, it’s certainly low-income residents, not middle-income residents, who need assistance. In this regard, the data offers a new way to assess the final plan for East New York approved by City Council last April, revealing both good news and bad news. On the one hand, the final plan went farther than prior administrations’ rezoning efforts to encourage the creation of housing for families making between 30 and 40 percent AMI, or about $24,500 to $32,500 for a family of three. 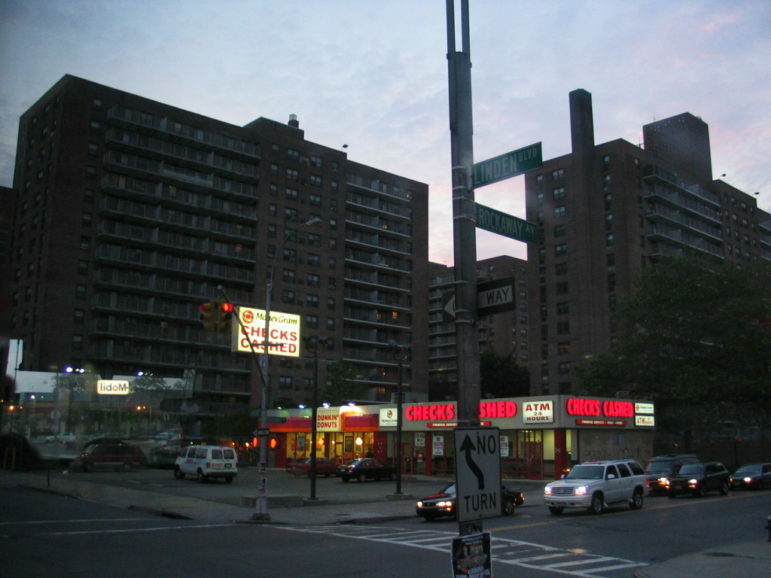 In East New York, roughly 85 percent of households in this income-bracket are rent-burdened. Assuming that the city’s current policy of allocating 50 percent of units to families in the local community district survives a court challenge, units created by the rezoning could help to alleviate this existing need. On the other hand, the plan does not include a significant number of units for families in the lowest income bracket, making below 30 percent AMI. 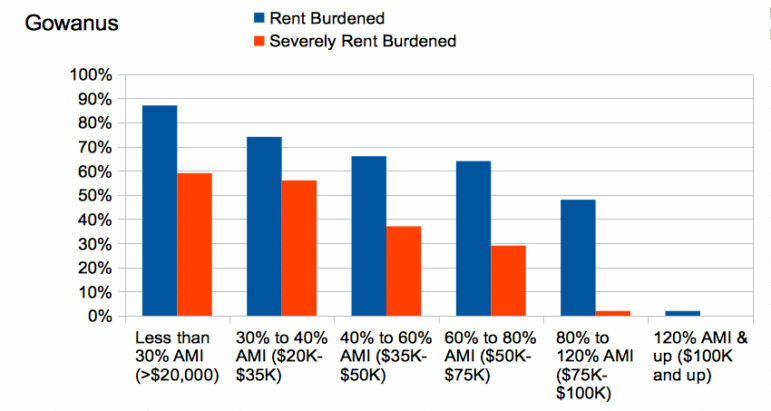 In East New York, households below 30 percent AMI are slightly less likely to be rent burdened than those between 30 and 40 percent, but are far more likely to be severely rent burdened. * Households in the lowest bracket also make up roughly 34 percent of the population, almost twice the size of the population making between 30 and 40 percent AMI. By City Limits calculation, the city’s plan would result in about five percent of total units for this income group, at best. 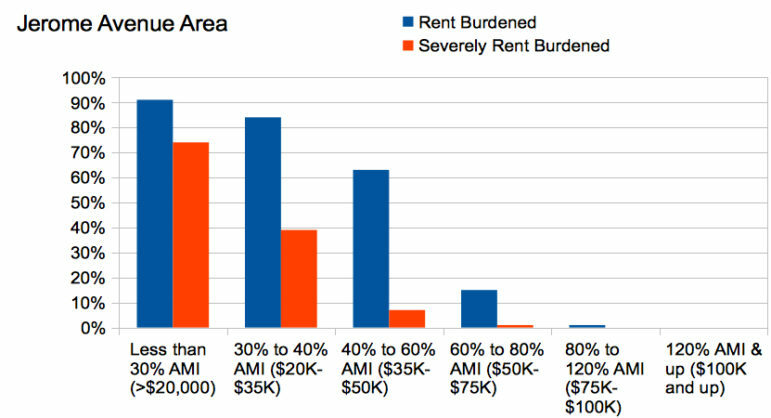 As for higher-income neighborhoods like Long Island City or Park Slope, middle-income households certainly could use some relief too—but it’s still true that a greater percentage of lower-income households need rent-relief. Oddo’s borough is an anomaly: though northern Staten Island is relatively high income compared to Jerome and East New York, the middle-class does not require relief from rent-burdening at all. 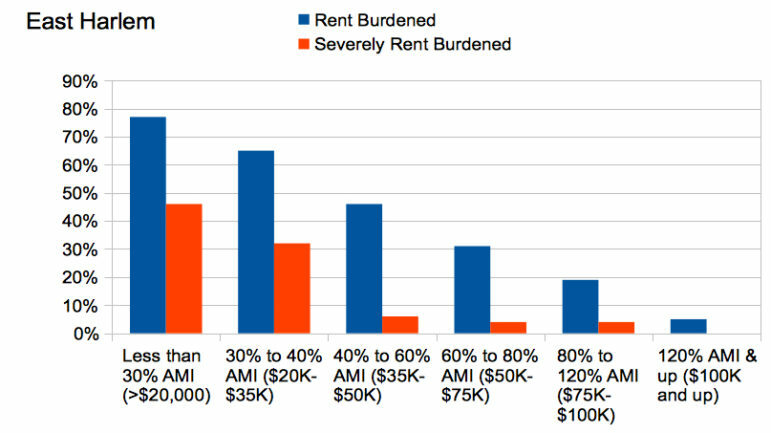 Extremely low-income households make up only about a quarter of the population of northern Staten Island, but three quarters of them are severely rent-burdened. “Many of them pay more than 50 percent of their income just to have a roof over their head. They still have to eat,” says Reverend Janet Jones, a member of the Staten Island Housing Dignity Coalition, a group that is advocating that the administration ensure that public land in the Bay Street area include a significant share of units for families making less than 30 percent AMI. As for the firefighters and cops that Oddo thinks the city should assist, “they can afford housing as it exists on Staten Island right now,” Jones says. Of course, a community may have other priorities beyond assisting today’s rent burdened residents. Some might argue that as a neighborhood’s rents increase, the middle class will eventually need a helping hand too, so it is logical to create middle-income housing today. In Goldstein’s personal opinion, if the city is going to take the needs of low-income families seriously, addressing rent-burden should be an important part of any housing plan. She notes that for a family with severe rent burden making $20,000 a year, it becomes a challenge to meet all other basic needs. By City Limits’ calculations, such a family would have about $800 a month remaining to spend on groceries, clothes, healthcare, and all other necessities. These are the kind of families, many advocates note, that are ending up homeless in surging numbers. The De Blasio administration says it is dedicated to addressing rent-burden and creating housing for families making the lowest incomes. “In Housing New York, this administration committed to providing far deeper levels of affordability than in the past, building and preserving housing for more of our City’s rent-burdened families. Two and a half years in, we are exceeding our targets: 28% of the housing we’ve financed is for the lowest-income New Yorkers, those making less than $40,800 for a family of three. And more than half of those homes are for New Yorkers making less than $24,500 for a family of three,” said Juliet Pierre-Antoine at the Department of Housing, Preservation and Development in an e-mail to City Limits. As part of its plan to create and preserve 200,000 units of affordable housing, the administration aims to dedicate eight percent of units, up from the two percent created by the Bloomberg administration, to families making below 30 percent AMI. It has so far exceeded its goal, with 13 percent of units serving families in that income bracket. Yet some advocates say that the administration is still not going “deep” enough. They note that households in that income bracket make up 22 percent of the city’s population, and 77 percent of those households are already severely rent burdened. The Department of Housing, Preservation and Development says it is already doing all it can, and that creating housing for families making 30 percent AMI or less requires tenant vouchers, which are in limited supply. Without more vouchers from the federal government, the agency argues, it would need to produce far fewer total units of rent-restricted housing overall in order to serve those families, which HPD does not believe is in the city’s interests. In addition, the agency says it is using many other strategies beyond its subsidy programs to assist families making the lowest incomes, including housing preservation policies, improvements to public housing, economic development strategies, and other initiatives. Later this week, City Limits will explore whether it’s truly impossible for the city to create more units for families making the lowest incomes. *Clarification: The census defines rent burden as the median percentage of gross, pre-tax income spent on rent and utility costs. Because the census gathers income and rent with a self-reported survey, it’s possible that some tenant households, asked to list “the monthly rent for this house,” report the rent on their lease when they’re actually paying less because of government assistance. This would happen in cases where households are both aware of the true market-rate rent of their apartment, and also receive rental assistance, such as for households with a section 8 housing choice voucher, public assistance with a rent allowance, Living In Communities Rental Assistance Program (LINC), Family Eviction Prevention Subsidy (FEPS), Special Exit and Prevention Program (SEPS), HOME Tenant-Based Rental Assistance, and some other programs. If the potential misreporting error were corrected for all such families, it’s possible that the difference in the percent of families in the <30 percent AMI and the 30-40 percent AMI brackets that are severely rent burdened would be eliminated in East New York and some other neighborhoods where there are high numbers of people on assistance. This would still not change the fact that the needs in those brackets are far more severe than those higher up the income scale. City Limits’ coverage of housing and development is supported by the Revson Foundation and the New York Community Trust. Middle class or poorer, I find it hard to believe that FDR’s New Deal and Lyndon Johnson’s Great Society ever intended to provide luxury housing replete with amenities galore and spectacular views, all just one stop from Grand Central, at a subsidized rate to those making $100k-$200k a year. I’m not knocking either program, it is just that we seemed to have strayed far …very far, from the mandate to help the poor and provide decent shelter. Gee you have to make $75K to be considered middle class??? I thought I was middle class making in the mid 40’s. I guess not. Housing is so expensive out there. I thank the lord every day for my rent stabilized apartment. Cops and firefighters are almost universally homeowners on Staten Island and elsewhere. When the Mitchell Lama program came in, a stated purpose for subsidizing middle income people was to keep the most reliable taxpayers on the City tax role and the City civil service workers in the City. I think that should remain one of the goals of subsidized housing. It requires that all subsided housing require that the unit be the legal address so taxes are paid to the City. I am a teacher in the DOE and a single mother of three. My rent of $2100 in Harlem which is supposedly a “steal” but to me it isn’t. I live in a building with many people who have been here for years and pay a considerable amount less than I do. After rent, I still have to pay utilities and feed three children. Forget about clothing and activities for my children!!! In NYC, we must be clear about affordable housing for all income levels. Lower income people are not the only people struggling in NYC. Oftentimes, they also receive other state and federal subsidies such as food stamps, section 8, ACD for child care. I don’t qualify for government programs and I don’t want to. Affordable housing would help me provide the other necessities for my family without living pay check to pay check. Where are the program for teachers??? The Department of City Planning discusses its draft rezoning framework for East Harlem. Comments on the draft scope for the environmental impact study of the de Blasio administration’s planned rezoning are due November 7.